Japan's current account surplus rose to 550 billion yen in April from 170 billion yen in March. The surplus is the largest in 14 months. Nominal exports rose by 4.6% reversing decline for the month while imports posted their second straight month-on-month drop but only after an import surge of some magnitude in February. Still, year-on-year exports are up by 9.1% and imports are up by a meager 1.2%. However, the trends for both flows are slowing; sequential growth rates show that both exports and imports demonstrate a steady lose in momentum as their growth rates diminish from 12-month to six-month to three-month. This is also signaled in the chart that shows that year-over-year flows; they too have been decelerating. With the surplus up in Japan and with flows decelerating, a sharper reduction in the pace of imports is clearly one trend that is in train. Weak imports suggest weak domestic demand. And over this period, the terms of trade have deteriorated for Japan (import prices have risen by more than export prices). Deterioration in the terms of trade means that imports are becoming more expensive relative to exports; that signifies some loss in welfare. This is the result of rising oil prices over the past year. 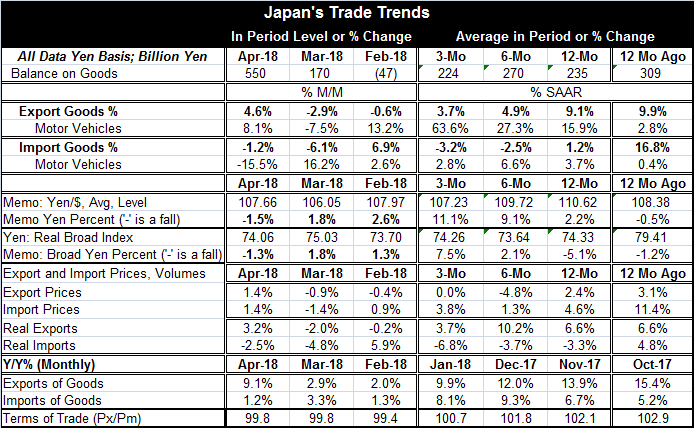 In fact, when we switch over to look at Japan's trade flows expressed in real terms, we see more stability in exports which on a real basis show growth over all three-month, six-month and 12-month horizons but show no clear trend in those rates of growth. Real imports, however, do show ongoing deterioration and signal domestic demand is weakening. Of course, Japan did post a contraction in GDP in Q1 2018. Imports very much have been signaling that weakness. Over 12 months, import volume is down by 3.3% while exports are advancing by 5.5%. The export advance is helpful, but it is not enough to offset domestic weakness. Over the last year, the yen is up by 2% vs. the dollar; over the previous 12 months, it had slipped by 0.5% vs. the dollar. The dollar yen exchange rate has been relatively stable over the past two years. However, the broad yen exchange rate has fallen by 5.1% over 12 months and was lower by 1.2% over the preceding 12 months to that. On balance Japan's trade flows are a good window into the inner workings of Japan's economy. Weak imports have pointed to weak domestic demand and that weakness has progressed and become more pronounced over the last three months with real imports falling at a 6.8% annualized rate as of April. Exports in real terms are up at only a 3.3% annualized rate in real terms over the last three months; not enough gusto to drive growth in the face of weak domestic demand. Japan still appears to be struggling with growth. And with that as the baseline case, the Bank of Japan's attempt to hit a 2% inflation target will become all the more difficult.